I love pumpkin, and I get really excited during this time of year when seasonal pumpkin dishes start popping up on menus. Yet, if there is one thing I can’t stand, it is the pumpkin spice latte. It makes me nuts when Starbucks declares that they have the seasonal drink in stores (which was months ago, by the way — waaaaay too early for my pumpkin cravings), and people get so excited. Every couple of years I think to myself, “Self, you should give that drink another shot — it can’t be that bad if everyone and their mother is excited.” And then, half a second after the first sip, I think to myself, “Self, it can’t possibly taste this way on purpose, can it? !” It is coffee for people who hate coffee and clearly don’t understand the nuances of the pumpkin. Now that that is off my chest, let’s talk about some of the wonderful pumpkin dishes Midtown is currently offering, for when you get that pumpkin craving. 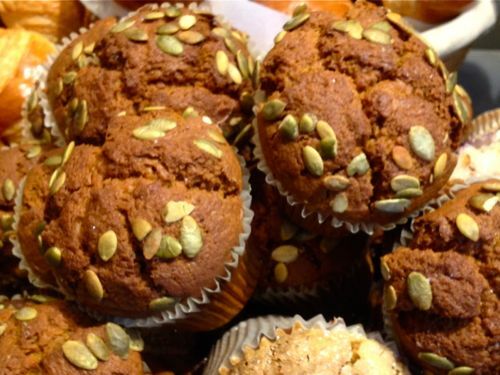 If you’re looking for pumpkin for breakfast, Le Pain Quotidien does a very nice pumpkin muffin ($2.85). I am especially a fan of the pumpkin seeds on top — they add a textural contrast and sweetness to balance the spices inside the muffin. The pumpkin corn bisque at Dishes is not new. If you frequent Dishes for lunch, you’ve probably even seen it. I had it for the first time this season a couple of weeks ago, and woah … is it good. You get a ton of whole corn kernels in this sweet-spicy-creamy soup. With a hint of cilantro, the soup’s warm spices and creamy texture are a very comforting pumpkin treat. Small is $4.75, medium is $5.75 and the large is $6.75, so it’s kind of pricy for what it is — and according to the Daily News, it is actually squash — but I really don’t care. This is good, hearty soup. 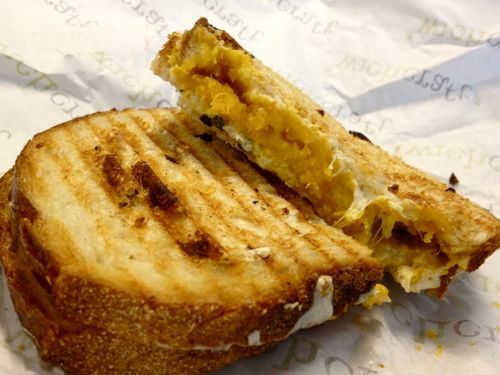 The roasted pumpkin sandwich at ‘wichcraft will run you $7.35. Because it is on grilled country bread (as opposed to ciabatta), it isn’t their most substantial option, but this baby is filled with pumpkin goodness. I definitely taste the sweetness of the pumpkin, and the sage really compliments the winter veg. Gooey mozzarella holds everything together. 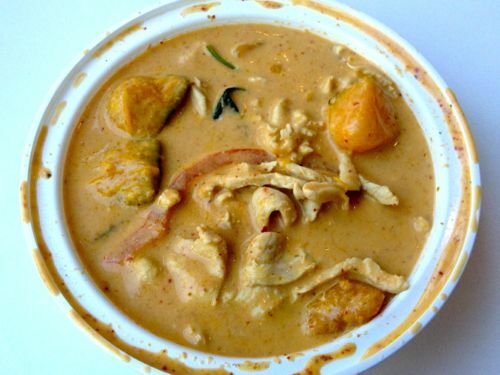 Like many Thai spots in the area, Qi serves up pumpkin curry on their specialties menu. Thai herbs and spices are blended in roasted chili paste with kaffir lime leaves and fresh basil simmered in coconut milk. The coconut milk and pumpkin both add sweetness to the spicy curry. They do not skimp on the white meat chicken or the pumpkin chunks, plus you’ll find red and green bell peppers mixed in. 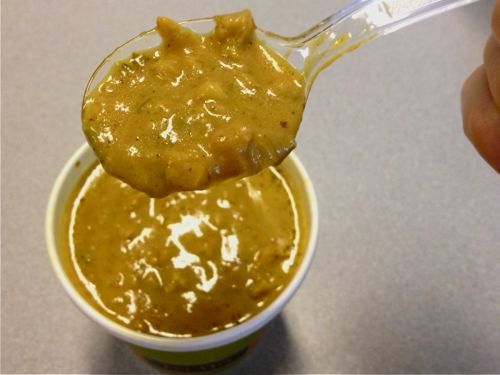 My perfect bite is a spoon of rice to sop up the curry with a little chicken and pumpkin. But, at $12, this curry is a splurge. Into pumpkin desserts? 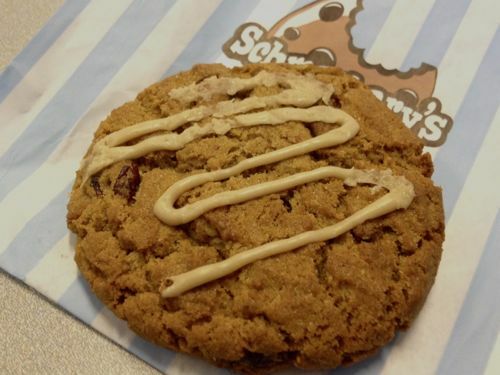 Schmackary’s has a pumpkin spice cookie ($2.75) that might be up your alley. Pumpkin with autumnal spices, cranberries, cinnamon chips and pecans, topped with maple buttercream make up this substantial cookie. You can definitely taste the “autumnal spices,” and even though I don’t know exactly what that means, it is definitely how I’d describe these spices. The sweet cranberries mixed with the spices is a nice contrast, as is the toasty pecans and smooth buttercream. 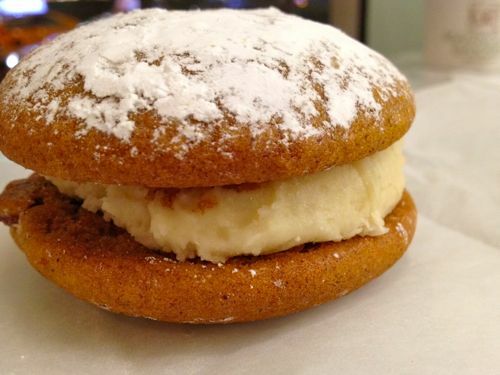 Like the pumpkin spice cookie, Magnolia’s pumpkin spice whoopie pie ($3.50) has dried cranberries hidden within the dessert. Smooth maple sweet cream cheese is sandwiched between the spiced, soft cookies. These are just the tip of the iceberg, when it comes to pumpkin. Next on my list of things to try is definitely Grand Sichuan‘s braised pumpkin with ginger and scallion. Do you have a favorite pumpkin dish in Midtown? Leave your picks in the comments below! Posted by Rachel Goldner at 11:30 am, November 7th, 2012 under 'wichcraft, Le Pain Quotidien, Magnolia Bakery, qi thai, Schmackary's. Treats Truck pumpkin bread (although it is available all year)!